Be the first to share your favorite memory, photo or story of Hazel "Wylene". This memorial page is dedicated for family, friends and future generations to celebrate the life of their loved one. 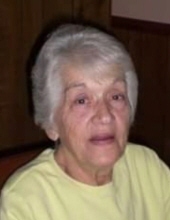 Hazel Wylene Dalton Lawhorne of Sweet Briar, passed away, Tuesday, Jan. 29, 2019 at her home. She was preceded in death by her husband, Elmo T. Lawhorne, Jr.; son, Kenneth Wayne Lawhorne; parents, Acie Dalton and Margaret Marr Dalton Fox; and brother, Wayne Dalton. She is survived by her daughter, Theresa L. Brown of Sweet Briar; sisters, Kathy Neely of Texas and Judy Younger of Gretna; granddaughters, Hilary L. Potts and Heather Werner and four great-grandchildren: Jake, Lila, Oliver and Emery. Her request was for private burial. To send flowers or a remembrance gift to the family of Hazel "Wylene" Dalton Lawhorne, please visit our Tribute Store. "Email Address" would like to share the life celebration of Hazel "Wylene" Dalton Lawhorne. Click on the "link" to go to share a favorite memory or leave a condolence message for the family.